One of our most reads is what Peter Diamandis always writes about that truly led us to "Think Think Think"!!! As we present this for all to consider, we extend thanksgiving wishes to all as we go dark through Thanksgiving here in the United States. To recap, while Web 1.0 consisted of static documents and read-only data, Web 2.0 introduced multimedia content, interactive web applications, and participatory social media, all of these mediated by two-dimensional screens — a flat web of sensorily confined information. During the next 2 to 5 years, the convergence of 5G, AI, a trillion sensors and VR/AR will enable us to both map our physical world into virtual space and superimpose a digital layer onto our physical environments. Web 3.0 is about to transform everything from the way we learn and educate, to the way we trade (smart) assets, to our interactions with real and virtual versions of each other. News media is big business. Just last year, global news media (including print) generated over 150 billion USD in circulation and advertising revenue. The news we listen to impacts our mindset. Listen to dystopian news on violence, disaster and evil, and you’ll more likely be searching for a cave to hide in, rather than technology for the launch of your next business. Imagine a scenario in which protests break out across the country, each cluster of activists broadcasting an aggregate of 360-degree videos, all fed through photogrammetry AIs that build out a live hologram of the march in real time. Want to see and hear what the NYC-based crowds are advocating for? Throw on some VR goggles and explore the event with full access. Or cue into the southern Texan border to assess for yourself the handling of immigrant entry and border conflicts. Take a front seat in the Capitol during tomorrow’s Senate hearing, assessing each Senator’s reactions, questions and arguments without a Fox News or CNN filter. Or if you’re short on time, switch on the holographic press conference and host 3D avatars of live-broadcasting politicians in your living room. We often think of modern media as taking away consumer agency, feeding tailored and often partisan ideology to a complacent audience. But as wireless mesh networks and agnostic sensor data allow for immersive VR-accessible news sites, the average viewer will necessarily become an active participant in her own education of current events. The future promises an era in which news is verified and balanced; wherein public ledgers, AI and new web interfaces bring you into the action and respect your intelligence — not manipulate your ignorance. 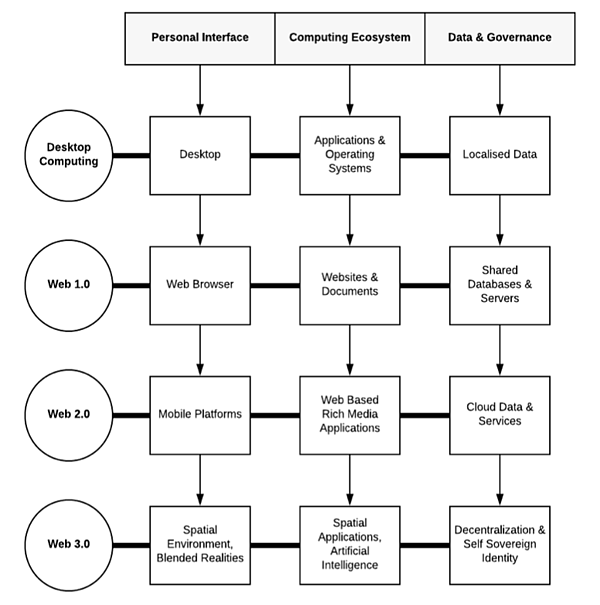 Bringing about the rise of ‘user-owned data’ and self-established permissions, Web 3.0 is poised to completely disrupt digital advertising — a global industry worth over 192 billion USD. As you move closer to a kitchen set that catches your eye, a virtual salesperson — whether by holographic video or avatar — pops into your field of view next to the fridge you’ve been examining and begins introducing you to its various functions and features. You quickly decide you’d rather disable the avatar and get textual input instead, and preferences are reset to list appliance properties visually. As I pick out my selection, my AI assistant hones its algorithm reflecting new fashion preferences, and personal shoppers — also visiting the store in VR — help me pair different pieces as I go. After I’ve made my selection, I might choose to purchase physical versions of 3 outfits and virtual versions of 2 others for my digital avatar. Payments are made automatically as I leave the store, including a smart wallet transaction made with the personal shopper at a per-outfit rate (for only the pieces I buy). Already, several big players have broken into the VR market. Just this year, Walmart has announced its foray into the VR space, shipping 17,000 Oculus Go VR headsets to Walmart locations across the U.S.
As AR headset hardware undergoes breakneck advancements in the next 2 to 5 years, we might soon be able to project watches onto our wrists, swapping out colors, styles, brand and price points. Or let’s say I need a new coffee table in my office. Pulling up multiple models in AR, I can position each option using advanced hand-tracking technology and customize height and width according to my needs. Once the smart payment is triggered, the manufacturer prints my newly customized piece, droning it to my doorstep. As soon as I need to assemble the pieces, overlaid digital prompts walk me through each step, and any user confusions are communicated to a company database.